Lieutenant Hank Blake recalls PT-375’s adventures and the Japanese surrender at Borneo. When the four members of the Japanese surrender delegation climbed aboard the deck of PT-375 on September 8, 1945, the boat’s skipper, Lieutenant Henry “Hank” Blake, directed the men to an open area on the forward deck where the Japanese could be closely watched for any signs of treachery. Imperial Japanese Navy Vice Admiral Michiaki Kamada—the ranking Japanese officer in Borneo—and two other Japanese officers began to proceed to the designated spot. 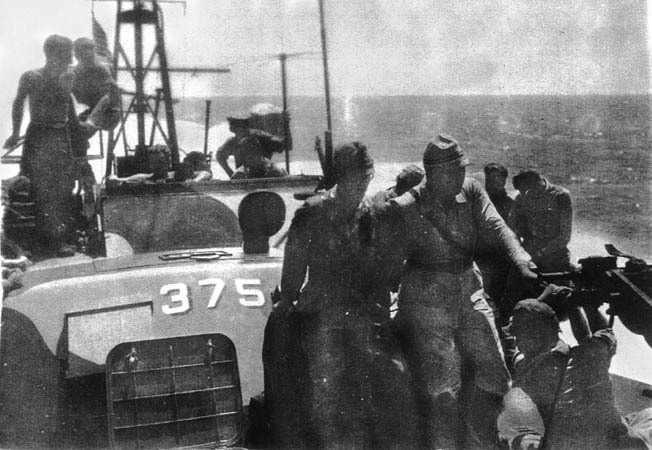 The fourth Japanese, a stocky, muscular enlisted man, stationed himself close to PT-375’s cockpit, effectively between the American sailors and the other three Japanese. PT-375’s taxi mission, which occurred six days after the formal Japanese surrender in Tokyo Bay, was the culmination of Hank Blake’s PT-boat career in World War II. Just how did the 25-year-old Pennsylvania native end up off the coast of Borneo, skipper of an 80-foot wooden boat loaded with 3,000 gallons of 100-octane aviation gasoline and bristling with weapons? With big ships coming and going in his hometown, just how powerful was the pull of the sea on young Hank’s impressionable mind? “I was just a kid,” he explained, “and my mother wanted to be sure I received proper religious training. So she would give me a nickel for spending money and send me away, push me out the door, to go to a Baptist church that was a block down the street. Lieutenant (jg) Hank Blake (left) and Lieutenant (jg) Patrick A. Requa. Requa was skipper of PT-375 when Blake reported aboard as third officer on March 8, 1945. Hank was bitten by the sea bug, and when the United States entered World War II there was no doubt regarding which branch of the service he would be joining. Three months after the attack on Pearl Harbor, he decided to skip graduation from Lock Haven State Teachers College (now Lock Haven University) and enlist. Hank’s skill in the water was apparent to the officer in charge of the program, and he gave Hank free rein to develop the swimming program. “They asked me to take this one platoon on a recreational swim. I think I had 36 guys in there, and 30 percent of them couldn’t swim the length of a swimming pool, yet these guys were going to be naval officers! If Hank’s explanation of why he chose the PTs seems a bit gung-ho, it’s because he was. It was just this type of aggressive, can-do spirit that the U.S. Navy looked for when choosing candidates for motor torpedo boat command. 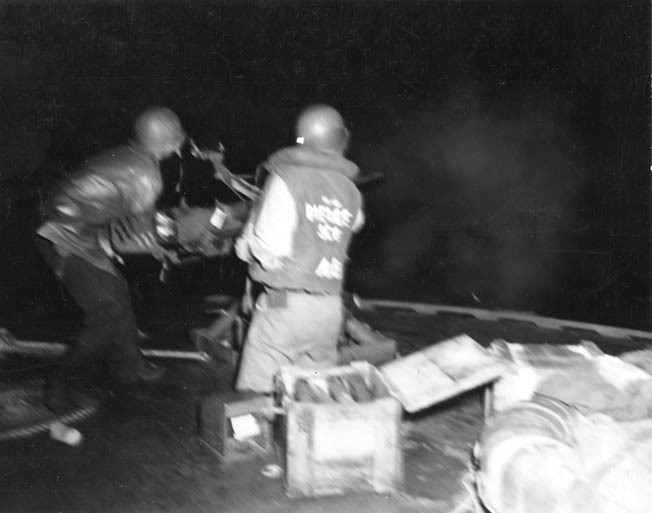 The gun crew on a PT boat fires one of its Oerlikon 20mm autocannons against Japanese-infested waters off New Guinea in November 1943. Note how reverberations shake the gunner’s body. Life on a PT boat during wartime could be perilous, and with a small crew of 14 to 17 men under one’s command, leading by example and being willing to take the war to the enemy without hesitation were critical attributes for a successful PT boat captain. Hank was busy with the numerous classes taught at the school—courses on navigation, gunnery, engine mechanics, torpedo maintenance, and boat handling among others. He did well in all of his courses, but his performance in one area really stood out. “Once our training was over, a lot of my classmates were immediately assigned to overseas boats,” Hank recalled. Overnight trips out to sea were one reason Hank didn’t make it home to his family’s one-room apartment each night. “Thorough training of new recruits included a trip from Melville to Bayonne, New Jersey, where Elco was building the boats,” Hank said. A PT boat crew goes through final shakedown during night training exercises in 1943. The boats were powered by three Packard V-12 engines that gave them a top speed of 65 mph. At the time of Hank’s arrival, Squadron 27 was under the command of Lt. Cmdr. Henry “Stilly” Taylor, a veteran of the early PT boat actions in the Solomon Islands. Ron 27 (the PT crews referred to a squadron as a “Ron”) had arrived in the South Pacific in May 1944, when the boats idled into the motor torpedo boat base on Treasury Island off of the coast of Bougainville. Over the next two months, Ron 27 engaged the Japanese in the waters around the islands of Bougainville, New Ireland, and New Guinea. In August 1944, the squadron moved to Palau in the Mariana Islands, then in late December 1944 it received orders for the move to the Philippines. Ron 27, comprising PT-356, PT-357, PT-358, PT-359, PT-360, PT-361, PT-372, PT-373, PT-374, PT-375, PT-376, and PT-377, saw action at San Pedro Bay and Subic Bay, where the boats engaged numerous enemy vessels and shore targets. Once Subic was clear, Ron 27 moved in. Hank’s arrival at Subic Bay was quickly followed by an event that was occurring less and less frequently in the southwestern Luzon area. Even though the U.S. Army Air Forces and Navy pilots had won air superiority in the skies over the Philippines, there was still an occasional air raid. Lieutenant (jg) Hank Blake (right front, with head lowered) was a champion wrestler in college. The U.S. Navy actively searched for such tough, competitive men to skipper PT boats in World War II. Blake died in December 2012. 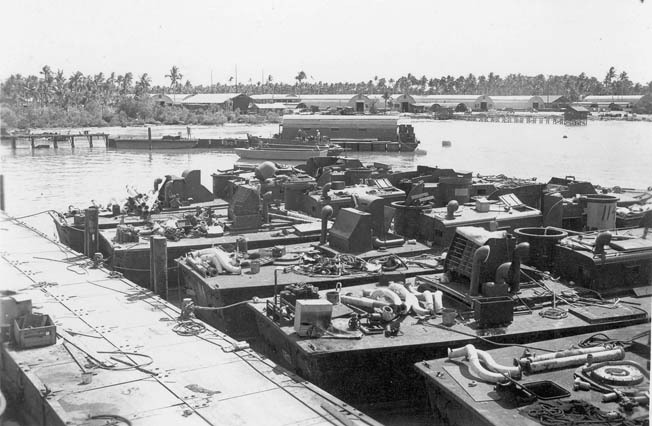 From Subic the boats patrolled south to the waters outside Manila Bay, and on February 3, 1945, Ron 27’s PTs became the first Allied war vessels to enter the bay since the surrender of U.S. forces on Corregidor in May 1942. Even though the bay was in American hands, the surrounding jungle on the large island of Luzon wasn’t completely clear of enemy personnel. 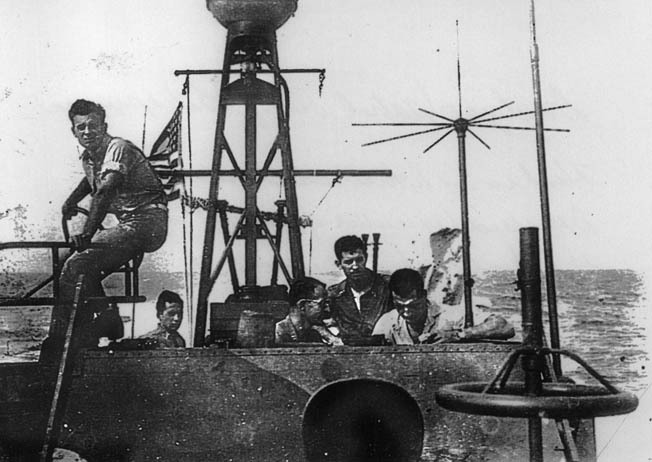 Japanese soldiers attempting to escape from Corregidor and the shoreline surrounding Manila Bay were often spotted in the waters offshore, and the deck log for PT-375 states that in March 1945 a Japanese soldier was caught in the boat’s screws while it returned from a nighttime patrol. Body parts were observed in the boat’s wake. Hank also recalled seeing Japanese attempting to escape the bay area by swimming out to sea. “Corregidor was just a great big rock with a little bit of brush around it, but not much. Japanese would get out of the brush around Manila Bay and start swimming out toward Corregidor. If they reached it, there really wasn’t any place to hide. They’d get ashore, then just keep a low profile. As the Americans pushed farther into the island of Luzon, however, targets of all types became fewer, so the PT crews turned their attention to other tasks. “It was evident by this time in the war that gunnery was much more important than torpedoes,” Hank noted. Frequent runs out to sea for gunnery practice against floating and aerial targets reinforced this emphasis on the PT’s primary role as a gunboat. For all of Hank’s time on PT-375, attacks were carried out exclusively with guns, and one particular engagement stands out in his mind. “I was Pat Requa’s executive officer. During a nighttime operation, under complete blackout, we engaged the enemy. I was at the wheel, and Requa was manning one of the twin .50-caliber machine guns located adjacent to the cockpit. A PT boat’s tiny “head” had to serve a crew of 14 to 17 men. Requa personally directed medical attention to his wound while Hank went back to the wheel and radioed for the location of the nearest hospital ship. He then headed the boat on a course to the ship and was able to immediately obtain full forward speed. In June 1945, the boats of Squadron 27 were ordered to the southern Philippine island of Samar to prepare for patrols supporting the upcoming invasion of Borneo. significantly reduce the boat’s top speed, and since speed was one of the PT’s primary strengths a clean hull was essential to mission success and the safety of the boat and crew. At this time Hank experienced a change in duty. “At Samar is where I became skipper of PT-375. What the Navy did was, they’d bring in an ensign to train, so for a short period there would be three officers on a boat. As soon as they thought the third officer was fit, the top officer would go home, the XO would be promoted to skipper, and the third officer would become executive officer. That’s how I became boat captain when we were based at Samar. I was second in command, then Pat Requa got his orders to go back stateside. “Another thing, the Navy’d send us kids, just 16 or 17 years old, never been away from home at all. When they wrote letters, an officer would have to censor them, so the crew would put the letters on my desk. This one kid from New Jersey was really excited about being on a boat, and he wrote all kinds of letters home. “Now, on a PT, you had all of these enlisted men using one head at the bow of the boat for shaving and toileting. 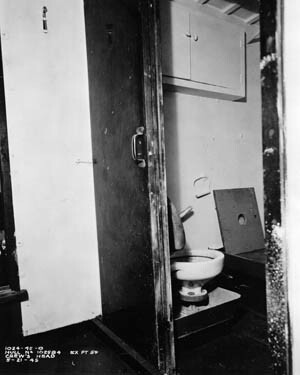 It was a lot of men in a cramped, condensed area using one stainless steel sink and toilet, so it could get really messy. Cleaning the enlisted men’s head was the nastiest job of anything on the boat, but everybody had to take a turn at it. “I put this boy from New Jersey on there right away to break him in—and he did such a magnificent job! I put him on there, and I’m telling you, that head looked like a jewelry store when he’d come out from cleaning it! Shortly after his promotion to skipper, Hank and PT-375 departed for the last major Allied invasion of World War II, the invasion of Borneo. The ground phase of the assault began on July 1, 1945, when Australian troops waded ashore. The Aussies had requested that the United States provide naval support for the operation, and as part of that effort four PTs of Ron 27 arrived in the area on June 27 prior to the invasion. The remaining eight boats arrived with the USS Varuna on the day of the invasion. Initially the boats operated out of nearby Tarakan, but once the Aussies had pushed farther inland on Borneo the PTs moved to the island itself to better provide effective, close-in support. “The entire squadron was assigned to a base at Balikpapan,” Hank related. “From there we made nighttime patrols along the coast and to neighboring islands. The strategy at that time of the war was to prevent the Japanese from supplying and rescuing some of their legions in the area. It was our duty to halt all enemy traffic, day and night, and to destroy armaments positioned along the coastline and on neighboring islands. We received specific assignments if there was a Japanese radio station or other installation that needed taking out. 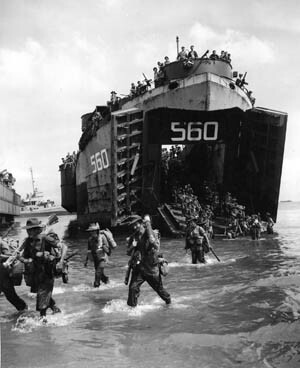 Australian troops pour ashore on Borneo from an American LST (Landing Ship, Tank), July 1, 1945. 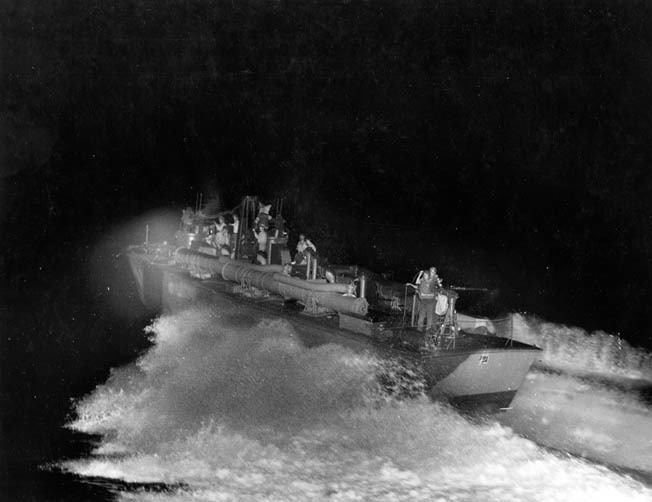 The PT boats of Squadron 27 provided close-in support to the invasion force. The Japanese employed all types of small craft from canoes to luggers and lighters in attempts to travel to or from the islands, but PT-375 and the other PTs drew the noose ever tighter around Borneo, choking off anything that floated. As had occurred elsewhere in the Pacific over the previous three years of warfare, the PTs were successful at minimizing the delivery of supplies to the Japanese on Borneo, as well as preventing the escape or evacuation of the beleaguered enemy personnel. Hank also credited the soldiers on shore with the success the Allies experienced there. “A very important element of this containment was provided by the Australian land forces,” he stated. 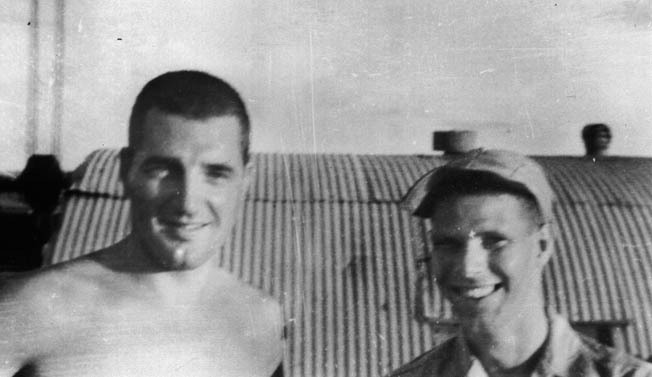 On many occasions throughout the Borneo campaign, the Americans and Australians cooperated operationally, coordinating Aussie air, ground, and naval support with U.S. Navy forces. As the Japanese resistance on Borneo steadily declined, the PTs went hunting elsewhere for enemy targets. The floatplanes were a hazard for the PTs because they would fly at a high altitude so they couldn’t be seen or heard, but they could spot a PT boat’s wake. “We had mufflers on the boat that controlled the exhaust noise from the Packard engines. If you were rushing between islands, you would put the mufflers wide open and just roar! But if you were snooping around there at, say, six knots, you could muffle all of your sound down into the water. But the boat still left a wake, and it was that wake that was giving the Japanese a good look at PT boat traffic. So with that fleet officer aboard, we headed out to look for possible air stations for these damn floatplanes. “As we were making headway—since it was daylight we knew we were vulnerable, so we just left the throttles wide open—we knew the Japanese knew we were there. If they wanted to come out and meet us, that was okay. So anyway, we were roarin’ along, and all of a sudden there was this awful sound coming from the stern of the boat. Now, these PT boats had direct drive; the engine output didn’t go through any gear reduction at all. We had three V-12 engines, and once they were put in gear you were going either forward or you were going in reverse. “Well, all of a sudden we heard this tremendous scream, and one of the prop shafts—the center shaft—had fatigued. When it snapped it dropped the prop off, too, so the center Packard was running at full speed with no load whatsoever on it! We quickly shut it down, turned around, and headed back toward base; we had no trouble because we still had two fantastic Packard engines. Hank also delivered native scouts to enemy-held shores. “They were Netherland East Indies Scouts,” Hank recalled. “I put them ashore for intelligence gathering on the Japanese. We’d run the boat up on the shore and drop them off.” Hank quickly realized that the native islanders were no fans of their Japanese occupiers. “The Japanese forced the natives to squat in their presence,” he said. “They couldn’t stand. That really pissed me off.” The native peoples of Borneo wouldn’t be squatting for long, however. Time was running out on the forces of Imperial Japan in Borneo and elsewhere. The PT cockpit was open to the elements, which provided excellent visibility. However, all hands topside were fully exposed. “In the daytime,” Hank continued, “the sun would be so damn hot that some of the boats rigged a canvas, like an awning, over the foredeck. If they didn’t take it down before a storm hit, the wind would just take it and go! Hank’s experience with boat handling allowed him to stay on course while plowing through such heavy seas. “You would have a course which was in your mind and set in your compass, and you would use the wheel to keep the boat headed in the right direction,” Hank explained. With Hank Blake at the wheel in PT-375’s cockpit, the Japanese surrender delegation (foreground) is treated to a “rough ride” in choppy seas, bracing themselves with the gun mount and ready box, September 8, 1945. “Sometimes these monster waves would come one after another, where you would be climbing, climbing, climbing, and you’d get to the top where the wave would drop out from underneath you, and then you’d slam down. There were elbows, knees, and legs broken on deals like that, and especially the filaments in light bulbs! “Anyway, the standard technique—if you were paying attention—was, as you’re going up one of these big rollers, you get almost to the top, and then throw the boat into a right hard rudder. That would kink the head of your vessel to the right, and then you would slide down the other side of the swell on your stern instead of coming down with a slam. Otherwise it would be like being on the end of a diving board with somebody jumping behind you. “As far as storms we were in, I remember one day a member of the crew was listening to a ballgame on the radio during the afternoon, before we headed out on the night’s patrol … and we heard the war was over. As announced on Hank’s shipmate’s radio, the war was indeed over. Across the Pacific, as had happened across Europe when Nazi Germany capitulated, men celebrated in various ways, some noisily, some quietly. What did Hank and his crew do? “Well, my squadron commander, Stilly Taylor—who by the way was pretty informal—had 12 boats in his squadron,” he says. “There were something like two officers and 14 or 15 enlisted men on each boat, and someplace or another he got some cases of cold beer. Hank’s beer delivery was no doubt gladly received by the PT crews, making him a popular guy for a day. And even though the small crews and close quarters of PT service tended to lead to informal relations between officers and enlisted men, with his own crew Hank was a by-the-book skipper, no nicknames for him. After the Japanese surrendered unconditionally aboard the battleship USS Missouri in Tokyo Bay on September 2, 1945, formal surrenders had to be arranged for the Japanese forces that were still scattered across the vast Pacific. On the morning of September 8, 1945, Ron 27’s commander, Stilly Taylor, led seven boats including PT-375 to Borneo’s Koetai River delta for a rendezvous with the Japanese surrender party. “The naval officer in charge of this deal called down and said he wanted the fastest boat to go pick up the Japanese surrender party,” Hank remembered, “and his direct order to me was, ‘Give the bastards a ride’ [meaning a rough ride]. Now that was no problem because there was almost always at least a five-foot sea running between the coast of Borneo and the Celebes group, which was many miles away. There was a force of water down through there that poured on down into the seas below Australia. We also didn’t receive any orders about being polite or anything to the Japanese. “They were brought down the river to the delta on a little wooden Australian riverboat, and we could see four Japanese aboard—three officers and a fourth that was a bodyguard. Anyway, we had these huge mufflers on the stern, so we never wanted anybody, ever, to approach us from the stern because if they crashed out on it you had no way to silence your nighttime patrols. So sure as hell, this Australian guy who was handling the riverboat came right in and almost got on our mufflers. I waved him off and told him to get around forward on the bow. “After he swung around, the Japanese came up off of the riverboat, and there was no saluting, no formalities. I wanted them farther up on the bow, and that’s when the bodyguard started to stall along, so I was nasty with him; but I didn’t get any complaints from our higher-ups afterwards. I took the Japanese to an Australian warship [the frigate HMAS Burdekin], dropped them off, and that was it. After the surrender run, Hank’s time with PT-375 was limited. With her racing screws and sleek hull, he would always remember her for her exceptional speed. “The boat and all of the armaments functioned perfectly,” he stated. “Other than losing the center shaft and prop when the crystallized shaft broke, there weren’t any major problems.” Of course, had the shaft not failed, PT-375 would not have ended up with her racing screws. There was no doubt PT-375 was a good boat. However, as Hank spent much of his time at Melville as an instructor with Squadron 4 on Higgins-built PTs (Higgins and Elco were the two primary manufacturers of PT boats for the U.S. Navy in World War II), the question begs to be asked: what was his favorite attribute of the Elco PT boat? Was it the graceful lines? The speed? The drier ride as compared to the Higgins design? For Hank, it was much simpler than any of these. “They had ice cubes,” he explained. Ice cubes? Yes, the Elco PTs had small refrigerators in the tiny galley, and the availability of ice cubes to chill a drink in the heat of the tropical Pacific was an invaluable luxury for sailors with few such things, and a cooling touch of home for men at war. After the war, the U.S. PT boat fleet was either scrapped or sold to private parties or other nations. Here a flotilla of obsolete boats at an unidentified naval scrap yard wait silently to meet their doom. Neither her speed nor ice cubes could save PT-375 from the fate that awaited her and many other PT boats at the war’s end. “The Navy processed every single knife and fork and spoon, anything they could save on the boat. All processed,” Hank said. “When all of that processing business was done, then they took the crew off. Now I had myself and another officer and a boat that had no equipment and no crew! After a couple of days, they took my XO away, and a couple more days and they took PT-375 away. From there I went into temporary officers quarters. PT-375 and the U.S. Navy’s more than 500 motor torpedo boats had served their country well during a time of immense danger and difficulty, and men like Hank made sure the boats were used to their full potential, thereby making an important contribution to the victory over tyranny and fascism during World War II. Fortunately, that is exactly how things worked out for Hank Blake, due in part to PT-375, the fastest PT boat in Borneo! Tags Allies, Axis, Borneo, Bougainville, Corregidor, Japan, Japanese, Leyte, memoir, Nazi Germany, New Guinea, Pacific Theater, Philippines, Solomon Islands, South Pacific, U.S. Navy.